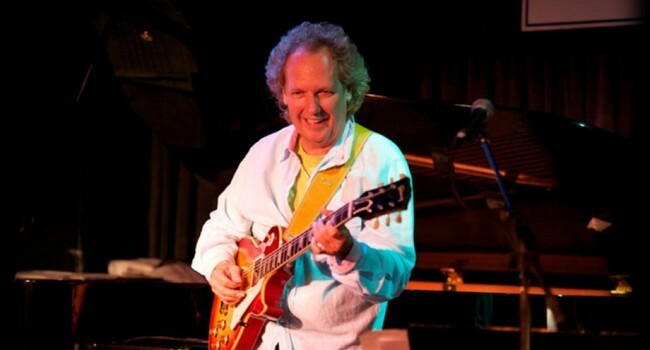 Growing up in L.A. in the 60’s, Grammy award winning guitarist Lee Ritenour received a rich cross section of exposure to jazz, rock and Brazilian music. From one of his first sessions at 16 with the Mamas and Papas to accompanying Lena Horne and Tony Bennett at 18, his forty year eclectic and storied career is highlighted by a Grammy Award win for his 1986 collaboration with Dave Grusin, Harlequin; 17 Grammy nominations; numerous #1 spots in guitar polls and the prestigious “Alumnus of the Year” award from USC. He has recorded over 40 albums, with 35 chart songs, notably the Top 15 hit “Is It You,” which has become a contemporary jazz radio classic. In the 90s, Ritenour was a founding member of Fourplay, the most successful band in contemporary jazz, with keyboardist Bob James, bassist Nathan East and drummer Harvey Mason. The first Fourplay album in 1991 spent an unprecedented 33 weeks at No. 1 on Billboard’s contemporary jazz chart. Adding to this legacy is his latest CD Smoke ‘n’ Mirrors; the recently completed Grammy nominated recording Amparo, (a follow-up with Dave Grusin to their highly-successful 2001 Grammy Award nominated contemporary classical crossover CD) and producer of Gordon Goodwin’s Big Phat Band’s latest CD Act Your Age (which is nominated for 3 Grammys. It’s been a long road since the seventies, when Ritenour’s legendary Tuesday night appearances at the famed Baked Potato, with a band including Dave Grusin, Patrice Rushen, Harvey Mason and Ernie Watts became part of the musical landscape for five years. Eric Clapton, Jeff Beck, George Benson, Al Jarreau, Joe Sample, and even Bob Dylan and Joni Mitchell could be seen in the audiences that would pack the house till the wee hours of the morning. From rock to blues to jazz, his diverse music became the foundation of over 3,000 sessions as a young guitarist with a broad spectrum of artists such as Pink Floyd (The Wall), Steely Dan (Aja), Dizzy Gillespie, Sonny Rollins, Joe Henderson, B.B. King, Frank Sinatra, Simon & Garfunkel, Ray Charles, Peggy Lee, Aretha Franklin and Barbra Streisand. Not to forget the dazzling array of talent appearing on his solo works and collaborations, notably– Phil Collins, Brazilian greats Ivan Lins, Caetano Veloso, Djavan and Jao Bosco, George Benson, Chaka Kahn, Herbie Hancock, Michael McDonald and opera great Renee Fleming.